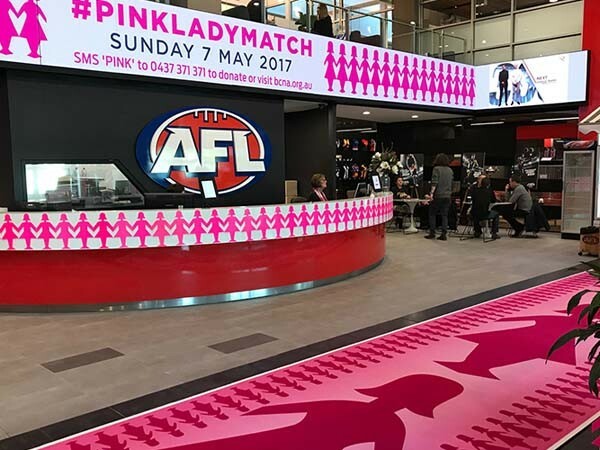 Godfrey Hirst Australia partnered with the Breast Cancer Network Australia (BCNA) to commemorate the 2017 AFL Pink Lady Match. The AFL Pink Lady Match aims to raise funds for, and awareness of breast cancer, still the most common cancer affecting Australian women. In 2017, it is estimated that 17,586 women and 144 men will be diagnosed with breast cancer. This year, the BCNA partnered with the Melbourne Football Club to help turn the MCG pink by hosting a High Tea event on Sunday, 7 May. Guests were joined by Channel 7’s meteorologist, Jane Bunn and Australian Olympian and breast cancer survivor, Raelene Boyle. Godfrey Hirst created two custom pink lady runners to mark this important and memorable occasion. Created using Godfrey Hirst’s innovative Designer Jet technology, the first runner was installed in the foyer of AFL House, Docklands, and the second runner was put on display at the BCNA high tea function on Match Day.